This was a real design challenge. 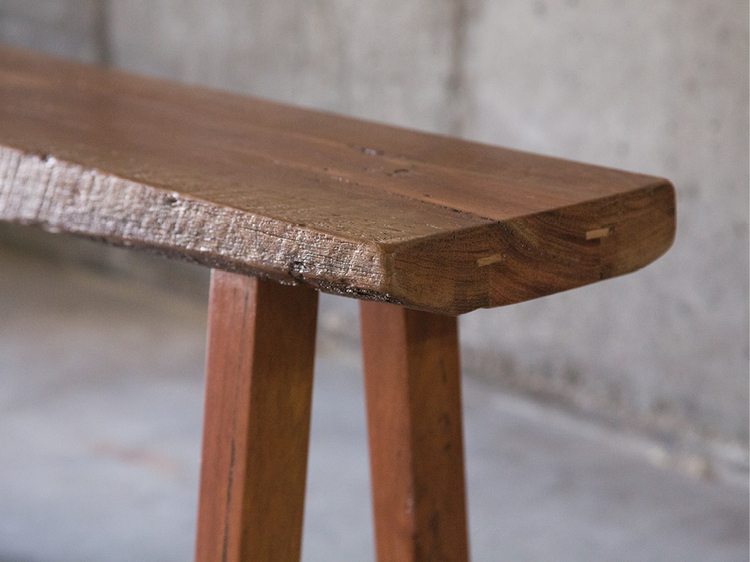 Turn a few fence posts into a table that is functional and stylish. The result - a mitred loop frame with a fence post top floating on aluminium dowels. This wood was sourced from verge finds in the Melville area. The idea for this table started when I got an email from a friend who knows my passion for woodworking and gave me a tip-off about a skip full of Jarrah in White Gum Valley. I went round to investigate the following day and had a chat with the guy who had dumped it. He said it was originally the frame for his shed - I told him my story and he was genuinely pleased to give me the wood so it could have another life. The top of the table was made entirely from the wood I found in the skip. It was a laborious task to take the wood from its weathered, unloved state to the highly polished look you see now. The legs were made from old door frames - if you look closely you can still make out the hinge hole patterns and the hole where the door catch would have been. All the defects were filled with a clear epoxy so you can still see the wood’s original use. I want my products to be honest and proud of their past life!